What is 24 HOUR ECG MONITORING (HOLTER MONITORING)? 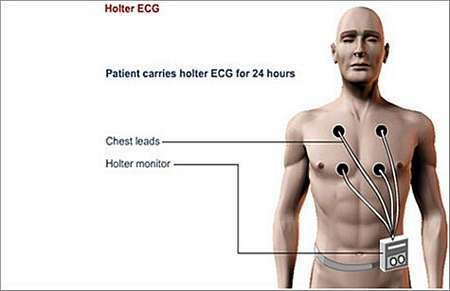 Holter monitoring involves continuous ECG recording for 24 hours. This method of testing picks up symptoms and signs that do not occur that often, for example heart palpitations (sensation of heart beating in chest). It therefore makes it easier for the doctor to diagnose symptoms that are unlikely to present while the patient is in the surgery for the consultation. The patient needs to visits the hospital (outpatients) on two occasions; once to have the recorder fitted and once to have it removed. Small patches are placed on the patients chest wall. Wires are then attached to the patches. The wires are taped down, because the patient will be walking and sleeping with a device (a small portable tape recorder) that is attached to a belt around the waste. The patient can take part in all normal activities during the 24-hour period except for taking a bath or shower. The system is very comfortable and quiet and the patient will hardly be aware of its presence. The doctor will encourage the patient to spend a normal day that encompasses any type of physical activity that may bring on the symptoms. The patient will also be required to keep a diary of the various types of activities performed during the 24-hour period, indicating what symptoms appeared at what time and during what specific type of activity. Special attention will be paid to symptoms recorded during specific activities; this will aid in making a more accurate diagnosis. What does the Holter ECG demonstrate? A 24-hour ECG recording can give a lot of useful information. It indicates whether treatment is warranted when certain symptoms occur and it may be able to provide reassurance, showing that other symptoms are not dangerous to the patient’s health.